There is more to bridesmaids dresses than just color and style. The fabric is an equally important factor. The fabric you choose has a huge impact on the overall effect of how your bridesmaids will look on your wedding day. The same color can be entirely different when done in two different fabrics. Similarly, the same dress pattern will drape differently depending on how structured or soft the fabric is. Just like wedding gowns, bridesmaids dresses are available in different fabrics. When you know what your options are, you can find a dress that is better suited for the formality of your wedding. It is equally helpful to know what you will be getting, if you are ordering your dresses online, or aren’t attending the shopping session. This primer on bridesmaids dress fabrics will provide you the information you need to make your decision. You must have heard of terms like fabric, finish, fibers and blends, a lot. Unless you are a seasoned expert in textiles, all these terms may mean the same to you. However, each of these refer to different things. To understand what your options are, you should first gain an understanding of what each of these terms mean. Let us look at them now. Fibers: Fibers refer to the strands used to make the yarn. They are the smallest or most basic unit of any piece of clothing. For example, a cotton dress is made from fibers of cotton, which comes from the cotton plant. Other fibers are wool, silk, and hemp. Fabric: Fibers are woven or knitted together to create fabric. So, we can say that fibers are ingredients, that join together to make fabrics. Yarn can be woven together in different ways, with variations in the number of horizontal threads and vertical threads used, or in the way they are interlocked. Depending on the pattern, the thickness and structure of the fabric will vary. Blends: Blend refers to the different combinations of fibers in a fabric. It isn’t always necessary to use the same fibers to make fabric. It is also possible to mix different fibers, so we get a better result. For example, cotton fibers may be mixed with synthetic fibers like polyester to create durable and wrinkle-free fabric. Finish: We spoke about how fibers form fabric through the process of weaving or knitting. Finish refers to the final look and feel of the material, after the processes that render it ready for use in a garment. For example, satin is a finish that can be achieved by the combination of different types of fibers. So, when a dress is said to be satin, it will have the silky sheen that is characteristic of silk. Nevertheless, it isn’t necessary that it is made out of silk fibers. The same finish can be achieved by suitable combinations of other fibers too. Where bridesmaids dresses are concerned, we are more interested in finishes, than the fabric, blend or fibers. So, let us start with the most common finishes that are seen in our collections at Best for Bride, and learn about each of them in greater detail. Chiffon is light-weight, sheer fabric that is slightly see-through. It is light, slippery and softer than georgette, which it is often confused with. The main difference between the two is that chiffon is more lustrous and smoother. Chiffon doesn’t cling, and so it is a good choice for dresses with layers. It is commonly used in a layered style, to cover up the sheer effect that is characteristic of the material. This light fabric feels cool on the skin. Hence, we think this material is ideal for outdoor weddings in the warmer months. Satin refers to weaves with smooth and shiny surfaces and dull backs. Although satin was originally made from silk, nowadays, it is also made with synthetic varieties as well. Satin has a luxurious look and is what typically fits the description of the word “silky.” It is soft and lustrous and drapes snugly. Hence, it is a good choice for dresses that are form-fitting. The light glossy surface has a characteristic sheen. This makes the material great for night time events. 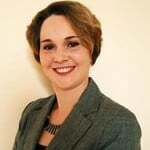 It may not be the best choice for outdoor events in the warmer months, as it quickly shows sweat. The actual thickness and weight of the garment will depend on materials that have been used to craft the satin finish. So, you can expect a silk satin to feel different from a satin that is made from rayon or polyester. Often confused with chiffon, georgette is also a thin, sheer fabric. However, the difference is that it is less lustrous but springier. It is dull in comparison to chiffon. Originally, georgette was fashioned out of silk. However, this finish is achieved using synthetic fibers like polyester these days. The characteristic feature of georgette is it’s crispy crepe-like structure, which is also the factor that distinguishes it from chiffon. It is also slightly heavier, but the drape is similar. The dress featured here is the 8156 full-length bridesmaid gown from the Social Bridesmaids Fall 2015 collection. You can see how the fabric is more solid than the chiffon dress we saw earlier, while both fall similarly. 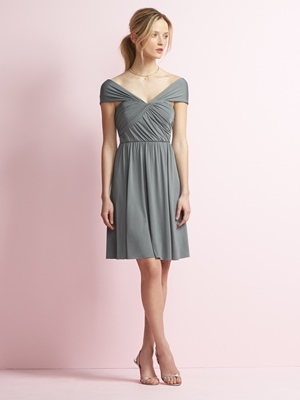 This dress has one shoulder draped bodice detail and gathers at the skirt. This is a lightweight sheer fabric, with a silky finish and lustrous texture. Originally derived from silk, mousseline is now also available in synthetic fiber blends. Although it resembles chiffon in look, it is more structured and heavier. It is sometimes also known as mousseline de soie. Mousseline is often paired with a soft overlay for a more dramatic effect. 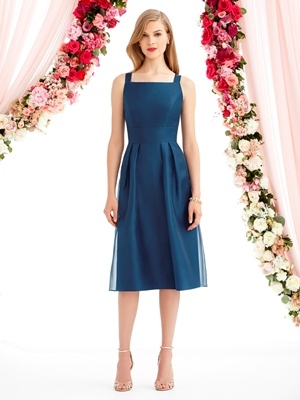 The bridesmaid dress 6745 shown here, belongs to the After Six Bridesmaids 2016 collection. 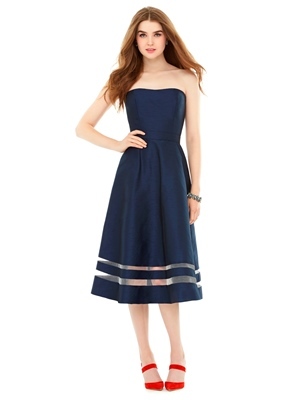 The sleeveless dress features a square neckline and an A-line skirt with soft gatherings. The back of the dress has criss-cross straps. The first thing that comes to mind, when we hear the term tulle, is tutus. This is similar to very fine netting. This finish is very lightweight and can be made from various fibers including cotton, silk, and nylon. It can be used to add a defining layer to a dress and is used as the uppermost layer in dresses. The sheer nature of this fabric makes it necessary to use it in several layers or as an overlay. It is a material that is commonly used in wedding gowns. However, we can also find many bridesmaids collections featuring this material. This dress belongs to the After Six bridesmaids 2016 collection. Here, soft tulle is used throughout, and there is a defining criss-cross detail at the waist. Sequined embellishments are present on the bodice with a defined waistline, and the full-length skirt has a pleated detail. The eternal vintage favorite, lace possesses a weblike structure formed of intricate details, done by hand or machine. Lace can be made from cotton, silk or even synthetic yarns. Depending on the design and motifs used, lace takes different forms and different names. It is sheer, and so has to have a thicker fabric layer beneath it. Lace can be used to create beautiful illusion styles on the neckline, sleeves, and back when used without a lining. Common laces include Florentine lace, alencon lace, Chantilly lace and the more recent laser-cut 3-D lace. 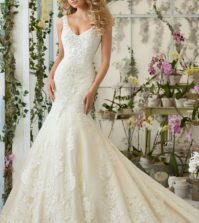 The Mori Lee 127 is a beaded lace gown with a sweetheart neckline, spaghetti straps, and modified A-line skirt. The beads encrusted on the lace used in this dress add a sparkling finish to the gown. Dupioni is a crisp form of silk with an almost iridescent effect. this unique feature is achieved by the mixing of different colors of thread in the weaving. The surface of the fabric is lustrous and the tight weave doesn’t allow light to pass through. The fabric is quite heavy, making it suitable for cooler evening receptions and weddings in winter or autumn. The uneven texture of the surface makes colors pop, making it an excellent choice for bright colors. It is also stiff and holds its shape. The D712 from the Alfred Sung Spring collection is a splendid dress with a soft sweetheart neckline and A-line skirt. The defined waistline and the illusion detail at the hem make it a brilliant and unique piece that every bridesmaid would love to be seen in. Jersey is a stretchy fabric, because of its close-knit structure. It is lightweight, and the characteristic feature is that it has one flat side, with the wrong side showing fiber piling. When more than two single jersey layers are knit together, the finish is heavier and the stretch is relatively reduced. 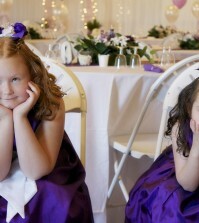 Jersey has a beautiful drape, making it a fantastic choice for bridesmaids dresses. The interlocking knits make it very comfortable, and it may be the ideal choice if you are looking for a snug fitting garment that feels comfortable too. 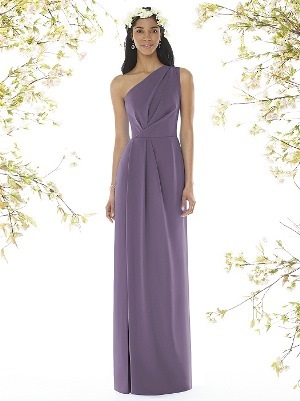 Featured here is the JY500 from the Jenny Yoo 2015 bridesmaids fall collection at Best for Bride. The dress has a V-neckline fashioned out of ruched cap sleeves, that criss-cross across the bust. The ruched bodice ends at the natural waistline, from where the shirred skirt is easily distinguished. Crepe is a fabric with a crispy appearance, and it usually looks like it is crinkled. It can be made using different fibers, including silk and wool. Since the fabric is quite structured and rigid, it has a definite drape and doesn’t fall softly. However, it is lightweight and stretchy. The fibers that make up the crepe determine how heavy it is, and one form can be very distinct from the other in overall appearance and luster. This dress belongs to the After Six bridesmaids collection. Crepe is the fabric that is used in this sheath cocktail length dress. It also has a removable shirred skirt fashioned out of lux chiffon. The dress features a high scoop neckline and the waistline is defined when the overlay skirt is chosen. how it drapes on your bridesmaids. Depending on the body structure of the different girls in your bridal party, you may like to play around with fabrics to find the best choice for each of them. While slim and well-toned figures can carry off figure clinging fabric finishes, it is better to go with more structured drapes when your girls don’t want to highlight certain parts of their body. A structured fabric will allow them to camouflage the less desirable aspects while drawing attention to their best features. To explore more options in bridesmaids dresses, or to take a closer look at any of the dresses we have featured here, visit our online bridesmaid gallery at Best for Bride, or walk into one of our stores. With leading designer collections that feature every fabric, finish, and design, you will have no trouble finding every dress that you need to complete your vision of the perfect bridal party to compliment you on your special day. Wow, that is a lot of terms that I never really knew about. I guess you are not just going to get a cotton dress 🙂 Thanks for the tips on these types of fabrics for wedding dresses. I think this is too involved. I just want to do something more simple. Its really just a a few hours on one day. I LOVE that blue dress that has the red stripes on it! WOW. That is an amazing look! Totally the same dress that caught my eye almost immediately! Lace is elegant and other than satin or silk, I cannot think of another fabric that would be used for a wedding day! Great post. This will be helpful to brides to be! Look, there is a lot of fabric out there and you have narrowed the search for me very well. But there are so many factors that go into which to choose. The problem that I have is I am not sure what order to choose things. The destination first, then the dress, or the other way around? Here is the thing. I really want to have a classy wedding dress. One that I can keep and possibly hand down. what is a good material for that? Good question. I do not think you can go wrong with any material in this case. Good luck!